Public discussions encourage posturing and allow die-hards to strangle compromise in its cradle. If the leaders of the parties are serious about reaching an agreement (some of their troops are not), they’ll have to shift course and enter into private, face-to-face negotiations, during which they would agree to cease tattling to the press about the transgressions of the other side. President Obama and House Speaker John Boehner will have to take the lead, as they did in the famously abortive “grand bargain” talks of 2011. Maybe. 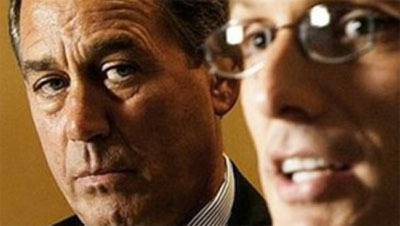 It’s true that there are signs that Boehner has a firmer hold on things than he did last year. The problem is that Galston is asking Democrats to take on faith the notion that Boehner can deliver on a genuine compromise proposal even if Obama ratchets down the public pressure. I’d call that a very dangerous proposition. The uncomfortable truth that everyone in Washington is tiptoeing around is that neither Eric Cantor nor Paul Ryan has explicitly said he’d be willing to raise real revenue yet. All they’ve signed up for is “pro-growth tax reform that closes special-interest loopholes and deductions while lowering rates.” This looks for all the world like a proposal that would lower rates, get back to revenue neutrality by imposing a few minor limits on deductions, and then add $800 billion in “revenue” from the alleged growth-powering magic of tax cuts. If you think I’m just being nitpicky, you’d better think again. These are the kinds of distinctions that killed the debt ceiling deal last year, and they’re the kinds of distinctions that people like Ryan and Cantor live for. They aren’t going to agree to a real revenue increase unless they’re under intense pressure, and that’s only going to happen if Obama goes public and stays public. There can be plenty of private talks at the same time, but they aren’t enough. Obama needs to keep pressing his advantage if he wants to keep it. Sweet reason behind closed doors isn’t going to get the job done, and Galston is being naive if he truly thinks differently.